With obesity occurring at epidemic proportions in the United States, losing weight can become a major issue in anyone’s life. Chronic obesity is now considered to be a treatable disease by the American medical establishment. Treatment involves a diet and exercise regimen and is sometimes supplemented with prescription weight-loss drugs. In extreme cases, bariatric surgery may be used. The goal of all of these treatments is a loss of weight. Even a modest loss of weight (between 5 and 10 percent of body weight) has all kinds of wonderful health benefits. Weight-loss medications (not to be confused with over the counter weight-loss supplements) work in several ways. They can either suppress appetite by blocking the hunger centers of the brain, have a diuretic effect by helping rid the body of excess fluids, prohibit the formation of new fat cells in the body, or increase our resting metabolism rates. There are many reasons why we diet. We diet to lose weight, lower blood pressure, lower triglycerides, improve cholesterol, decrease risk of heart attack and stroke, improve survival rate if we have suffered a heart attack, lower blood glucose levels, decrease diabetes risk, improve our mood, and improve our energy levels. These are all great reasons to lose weight, and most often the reasons that our doctor will give us when telling us that it’s time to go on a diet. Then there are some insidious reasons that we diet. Body image and self-esteem. This, sadly, occurs across genders but is especially difficult for women. “Research suggests that in general, women have slightly lower self-esteem overall when compared to men. But when it comes to body image, there is an enormous gender gap, with women reporting an overwhelmingly greater body dissatisfaction when compared to men,” according to Denise Martz, Ph.D., a clinical health psychologist. The images that we are bombarded with in the media plays into our insecurities. From thin, gorgeous actors (of both genders) to commercials for healthy foods, healthy diets, and exercise equipment (have you ever seen an overweight model using an exercise machine on a TV commercial? ), the models are universally slim and well-built. Advertisers “use perfect bodies to point up [women’s] body image dissatisfaction in order to sell [them] products to change that dissatisfaction. But when the diet doesn’t work, or the cream wears off, [women] feel like [they] have failed — and that’s when [their] self-esteem really plummets,” according to diet expert Abby Aronowitz, Ph.D. Sadly, these kinds of media images coupled with low self-esteem can lead to eating disorders. Also known as weight cycling, yo-yo dieting is losing weight and then regaining it over and over. Weight cycles can include losing and then gaining from as little as 10 pounds to as much as 50 pounds or more. In the United States, 20% to 55% of women have admitted to yo-yo dieting while only 10% to 20% of men have. Researchers at the University of California in Los Angeles have concluded that about 66 percent of dieters have regained more weight within five years than they initially lost. Those on very restrictive diets are more likely to gain back the weight than those on more forgiving plans. In other words, diets that promote slow and steady weight loss can be more successful than “quick fix” diets. The weight cycling loop can be broken. Researchers have shown that women with a history of moderate or large weight cycles are fully capable of sticking with a plan that would keep the weight off once they reached their goal weight. Weight cycling can be harmful to middle-aged women. It can result in “fluid shifts and electrolyte changes, such as potassium, that can cause deadly heart arrhythmias in susceptible middle-aged women,” according to Dr. Michael Miller, a cardiologist. Men are also negatively affected by weight cycling, but less so than women. Yo-yo dieting has also been anecdotally linked with high blood pressure, heart disease, cancer, high cholesterol, diabetes, and depression. 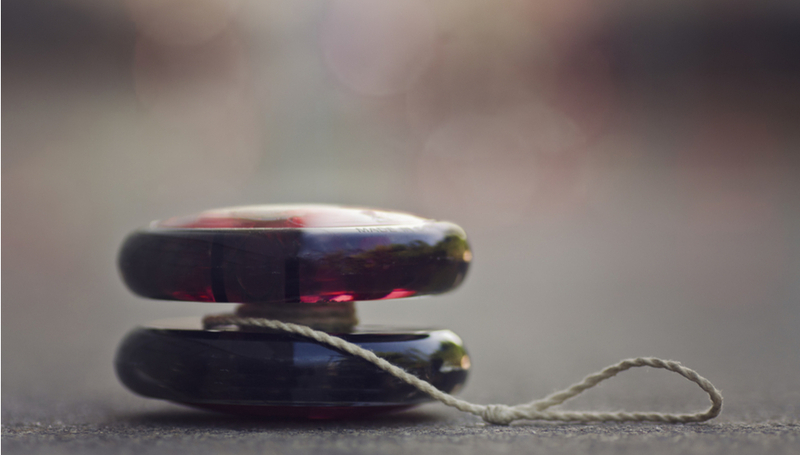 Yo-yo dieting can change the body’s physiology as well. The more diets that a person undertakes, the harder it becomes to lose weight. Ghrelin (a hormone that causes us to experience the feeling of hunger) levels increase, and leptin (a hormone that causes us to feel full) level decreases. Dieting becomes more difficult with each successive diet. Quick weight loss cycles are as dangerous as weight cycling. By reducing caloric intake by 500 to 1,000 calories a day, the dieter’s electrolyte levels (calcium and magnesium) can be depleted which can cause problems. Research demonstrates that 35% of dieters become career dieters, and as many as a quarter of all diets may progress into eating disorders. 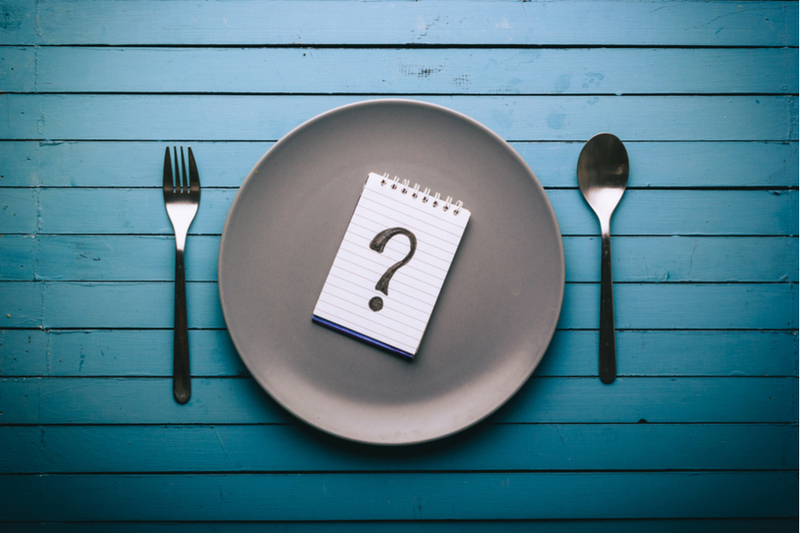 The question that begs is when does a diet become an eating disorder? The line may be thin. All diets begin with the intention of losing weight. Diets end when the dieter’s goal weight is achieved, or when the dieter gives up because the diet is too difficult, complicated, expensive, or restrictive. Eating disorders begin the same way, with a desire to lose weight. Sadly, in these cases, the diet never ends. From a psychological standpoint, diets are about food and weight. Eating disorders are about much more than that. Weight and food become more important than health and wellbeing. It all starts out as trying to lose weight but ultimately becomes a way to feel in control and avoid painful emotions. The diet does not end when a weight goal is achieved, because there is always a new weight goal. People who suffer eating disorders have attitudes that are dependent on their physical appearance and weight. Eating disorder is an umbrella term that covers a number of conditions that are characterized by an unhealthy relationship with food. They often develop in teens and young adults and are more common among girls and women than in boys and men. Eating disorders often coexist with medical and mental health issues such as low self-esteem, substance abuse, depression, and anxiety. In the United States, at least 30 million people across all demographics suffer from an eating disorder. Of all mental illnesses, eating disorders have the highest mortality rate. 13% of all women over the age of 50 exhibit some eating disorder behavior. Eating disorders are a severe medical problem that can have serious health consequences, and can, in extreme cases, lead to death. The hallmark of this condition is weight loss due to excessive dieting and/or exercise, often to the point of starvation (or malnutrition). The anorexic can never be thin enough, and sees themself as “fat,” even though others see them as too thin. Anorexics have a fear of gaining weight. In addition to relentless diet and exercise, about a third also binges and purges and often abuses laxatives. The condition may evolve as an interest in losing weight before an event (such as a dance), but as the disorder progresses, the importance of losing yet more weight intensifies. Untreated anorexia can lead to malnutrition and, in severe cases, organ failure. This disorder is characterized by a cycle of binging and purging. The bulimic overeats to the extreme, then vomits or performs other behaviors (such as using laxatives or fasting) to compensate for overeating. Bulimics feel no control in relation to eating. Unlike anorexia, bulimics often have a normal body weight. They still have the same fear of gaining weight and the same distorted body image that characterizes other eating disorders. Untreated bulimia can result in bleeding from the esophagus (due to constant reflux from stomach acid), dental problems, kidney problems, and abnormal heart rhythms. As with anorexics, bulimics are very good at hiding their condition. The disorder is marked by extreme overeating and, as with bulimia nervosa, feeling no control over eating patterns. People suffering from binge eating disorder often binge on large amounts of food. They feel out of control during these binges and often feel ashamed of their behavior. This can become a vicious cycle, as the more they binge, the worse they feel and the more likely they are to binge again. Because they do not purge, exercise, fast, or use laxatives, people who suffer from binge eating disorder are often overweight or obese. Unlike anorexia nervosa or bulimia nervosa, men are almost as likely to suffer from binge eating disorder as are women. According to the National Institute of Mental Health, the average onset age for binge eating disorder is 25, and it is less common in those over age 60. Left untreated, the health consequences for binge eaters is the same as that of other obese people – Higher incidence of heart disease and stroke, higher risk for developing type 2 diabetes, and the like. Comorbid with binge eating disorder are depression and anxiety. Unlike anorexia nervosa and bulimia nervosa, prescription weight loss drugs can be used to help these patients. 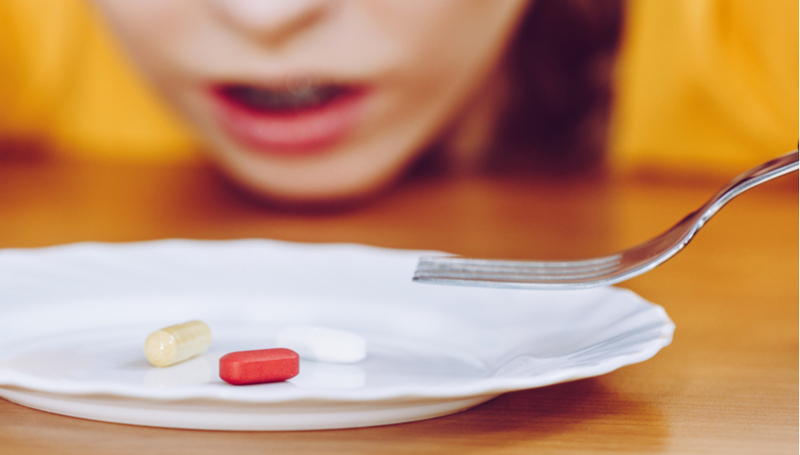 The misuse or abuse of diet pills (both prescribed medications and those sold over the counter) can be comorbid with anorexia nervosa, bulimia nervosa, and binge eating disorder. Anorexics and bulimics may abuse diet pills in order to compensate for calories that they have consumed. Some researchers claim that diet pill abuse among those with eating disorders may be as high as fifty percent. Since those that suffer eating disorders are already at risk for medical complications, abuse of diet pills can worsen their health consequences, and they may suffer increased tolerance and withdrawal symptoms associated with substance abuse. Some of the side effects of eating disorders may increase the side effects of diet pills. These can include nervousness, hypertension, fatigue, insomnia, heart palpitations, heart attack, congestive heart failure, renal failure, stroke, hallucinations, cessation of menstrual cycle in women, and other effects. Diet pills can also interact with other prescribed and over the counter medications that an individual is taking. A 2008 study found that people who both abuse diet pills and have an eating disorder also tended to have certain personality traits and mental health disorders including anxiety, borderline personality disorder, and tend to abuse alcohol. It is suggested that people with eating disorders who suffer anxiety may use diet pills (and other substances) to respond to underlying anxiety about their bodies, food, and weight gain. Over the counter diet pills or supplements may seem, on the surface, to be less dangerous than prescription medications, particularly because they are available without a prescription, but that is not the case. These drugs are not necessarily safe, as many of them have not been evaluated by the FDA. Nor do they do not need to prove that they are effective. Most frightening is that potential interactions with other drugs may be unknown and that people often fail to mention them to their health care professionals because they do not believe them to be drugs.